Made from brined grape leaves, rice, lemon and aromatic herbs, stuffed grape leaves -- also called dolmades -- make a zesty side dish or snack. The calorie count will vary according to how full you stuff your grape leaves and how much oil and added ingredients you use, but one or two grape leaves can easily fit into a sensible diet. Dolma recipes vary widely, but one "Vegetarian Times" offering, which includes pine nuts and currants but very little oil, contains about 47 calories per piece. A recipe from "Fine Cooking," which includes far more oil, contains 77 calories per piece. 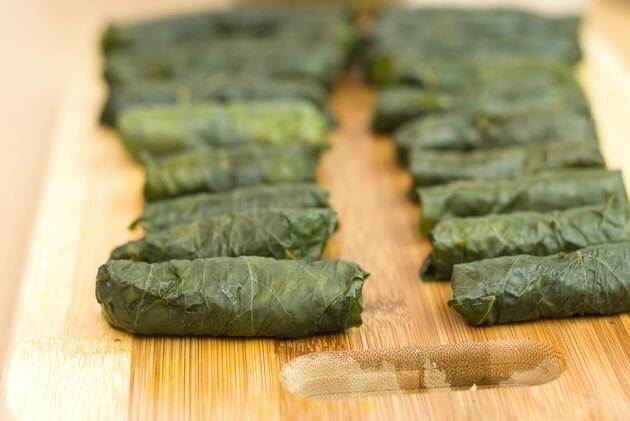 You may find lower-calorie dolmades at the supermarket: One store's version was 42 calories per piece, while another's was just 30 calories per piece. How Many Calories in Vegetable Potstickers?